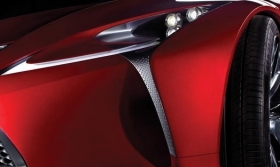 Lexus released this teaser shot of the concept scheduled for a Detroit auto show debut. LOS ANGELES -- Toyota Motor Corp.'s Lexus division will show a concept vehicle designed by its Calty studio in Newport Beach, Calif., at the upcoming North American International Auto Show in Detroit on January 9. The concept showcases the new design direction embraced by Lexus. Lexus said this vehicle is a concept, and not a prototype version of a production car. Lexus officials declined to say what shape or footprint the concept vehicle represents. At this year's New York International Auto Show, Lexus unveiled a GS sedan concept that closely mirrored the subsequent production version. At the time, Lexus said it was a concept showing future design cues. If this past precedent is any indicator, this styling exercise could show hints of the upcoming ES or IS sedans, both of which are slated to come in 2012.